A novel oxygenator helps minimize the impact of cardiopulmonary bypass by reducing hemodilution, minimizing inflammatory response, and providing highly efficient gaseous microemboli (GME) removal. The Terumo Cardiovascular Group (Ann Arbor, MI, USA) Capiox NX19 Oxygenator with UltraPrime Technology is intended for the exchange of gases between bloodcells and a gaseous environment, in order to satisfy the oxygenation needs of adult patients during cardiopulmonary bypass surgery. An integrated arterial filter removes non-biologic particles and emboli and facilitates air bubble removal from the blood flowing through the cardiopulmonary bypass circuit. In addition, an integrated heat exchanger is used to warm or cool blood and/or perfusion fluid as it flows through the device. 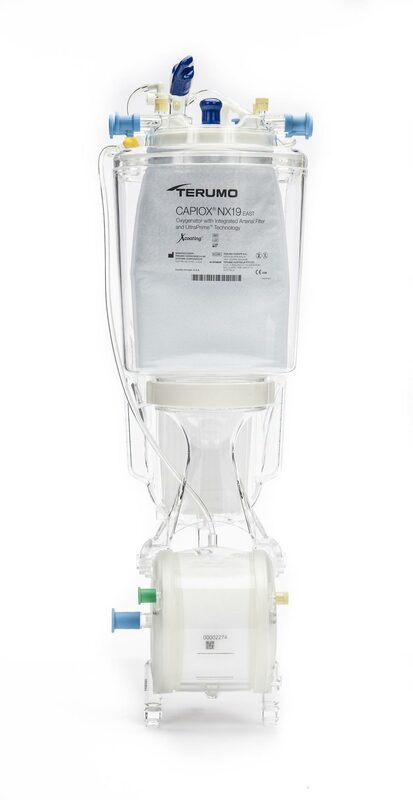 Image: The new Capiox NX19 Oxygenator with UltraPrime Technology (Photo courtesy of Terumo). A hardshell reservoir stores blood during extra-corporeal circulation, with a venous section comprised of a filter and defoamer to facilitate air bubble removal, and a cardiotomy section that contains a filter to remove particulate matter, as well as an additional defoamer. The technology is based on proprietary hollow fibers woven in a unique pattern, providing a low priming volume of just 185 mL, thus delivering high gas exchange performance without increasing pressure drop. The low priming volume also reduces hemodilution, leading to fewer blood transfusions and lower risk of acute kidney injury (AKI). Cardiopulmonary bypass is a is a form of extracorporeal circulation that temporarily takes over the function of the heart and lungs during surgery, maintaining the circulation of blood and the oxygen content of the body. The cardiopulmonary bypass pump, often referred to as a heart–lung machine, is operated by perfusionists.